Recently I was piling cash in my TD account waiting for an opportunity to buy dividend paying stocks. It wasn’t and it still isn’t easy to find a good dividend stock which would be priced at a value I would be willing to pay. Kinder Morgan Partnership was one of the stocks which early this year got overly overpriced by investors rushing into nice yield paying stocks. Later the stock lost the momentum and started drifting lower. Currently the stock is showing loss, but it seems finding a support at the short term (1 year) trend line. The picture below shows this price action. In January 2013 the stock sky rocketed and somewhat continued climbing higher just to peak at the end of April. Since then it continued downward. See the green line indicating the short term support I spoke above. Two months ago the stock created the short term low and offered an entry opportunity. These days the stock re-tested this support and it seems the stock will bounce and continue higher. 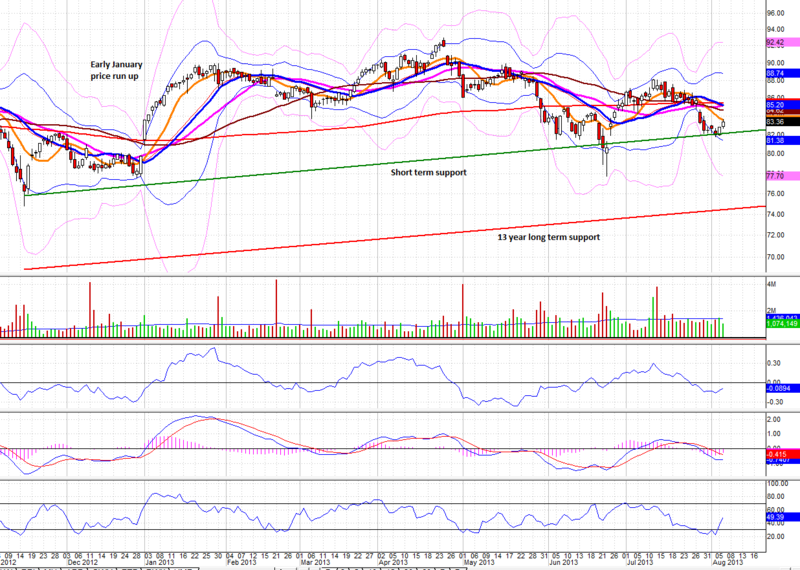 Of course the trend continuation reversal may fail and the stock may continue drifting down. I do not think this will happen. So far the stock found its buyers at these levels and as the stock would drift lower the rising yield would attract more income seeking investors. I don’t think the stock is in trouble. It recently increased increased its distribution rate or yield and it currently pays $1.32 per share quarterly, which translates to 6.38% yield. The company continues in acquisitions (recent Copano Energy transaction) and plans on increasing its exposure in Canadian market. As the US and Canadian energy production continues rising, Kinder Morgan will have great opportunities for further growth. From the long term perspective I consider this decline temporary and providing a great chance to add to my portfolio. To get into this stock I used my contingency order strategy. As you can see, lowering my entry target paid big time as I was able to enter into another position pretty cheap. This method of waiting for a good price AND a trend reversal at the same time is not 100% bulletproof. But as a long term investor I am not that much concerned if the stock fails continuing higher. If this reversal is false and the stock turns lower, I would expect it to go as low as the long term trend (see the red trend line almost parallel to the green one representing 13 years long trend). If that happens I will be adding more shares of this stock into my portfolio. This trade increases my overall dividend income in TD Ameritrade account to $813.60 annually. Thank you. I like the stock and will be buying more.